Darkness falls across Brookland, all Hallow's Eve close at hand. Music crawls in search of blood snakes through every neighborhood. Who-so-ever shall be found? Only those souls ready to get down for tonight’s Cityfox Experience Halloween Festival. Which will be held at Avant Gardner spanning four stages plus a downtempo lounge in Brooklyn from 9 PM - 6 AM for an absolute seriously spooky spectacular in a vast labyrinthine space. The event will take place in meticulously designed rooms with state of the art, immersive production by Reynard Productions (the crew behind Cityfox) while playing host to some of dance music's biggest names for a fright-filled night. Costumes are strongly encouraged for this Halloween extravaganza. 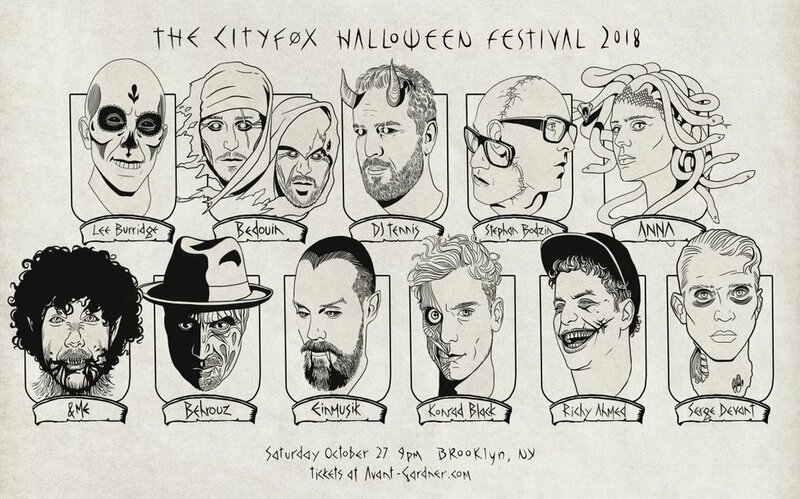 The Cityfox Experience Halloween Festival will feature 11 headlining spooky acts including Lee Burridge, Bedouin, DJ Tennis, Stephan Bodzin (Live), &ME, ANNA, and more international and local top house and techno talent. With multiple large-scale spaces which include The Brooklyn Mirage, The King's Hall and The Great Hall, this Halloween, the all-encompassing Avant Gardner will be equipped with crystalline KV2 Audio, expansive lighting and lasers, visual projection mapping, and atmospheric installations the likes of which the New Yorker techno community have never seen. With over 11 artists rounding out the lineup across a labyrinthine space, this will be The Cityfox Experience's most impressive production to date in what is sure to be the best party on this All Hallow's Eve. Tickets are ALMOST SOLD OUT act now while they last!